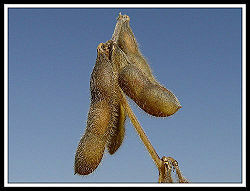 The soybean is an important agricultural plant that is used for vegetable oil and protein world wide, but perhaps best known for its use in soy sauce and tofu. 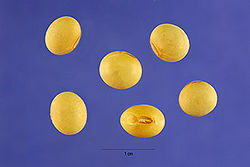 Soybeans are any of the species belonging to the taxonomic genus glycine. The species Glycine soja was first domesticated in northern China, but Glycine max is now more widely used for agricultural production. Today, the main producers of soybeans are the United States, Brazil, Argentina, China and India. North America Distribution of Glycine max. One of the most well known soy products is tofu. It is a white gel like substance that is made from the processed soybean. Many vegetarians and vegans use this food as a supplement in cooking since it is so high in proteins and nutrients. In general the soybean can be very beneficial to us all. Researchers have found that it can be very helpful to those who suffer from diabetes. It has also been proven that it can help a person stay lean by causing the body to produce fewer and smaller fat cells. Another plus is the fact that soy can lower cholesterol, therefore preventing the hardening of arteries and heart complications. It is important to remember that although soy is very beneficial to our health, it is not a miracle food. Many people become to obsessed with its health benefits that they eat too much. Just like with any other food, it is good in moderation and when paired with a healthy active lifestyle. Overall, the soybean is a great food that everyone should try at least once in their lifetime. Glycine by U.S. Department of Agriculture. This page was last modified on 14 August 2014, at 19:31.